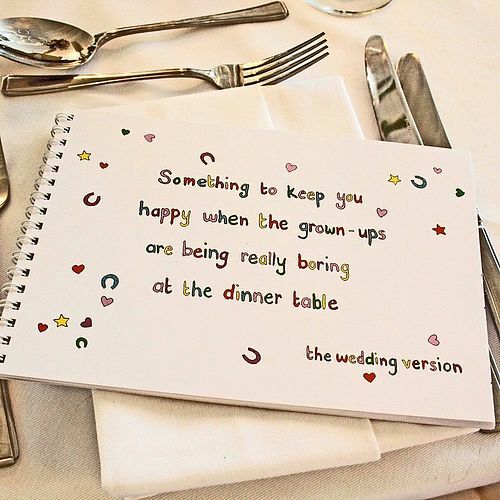 Choosing to invite kids to your wedding is an important decision you have to make as a couple. However if you're planning on having an adorable flower girl or rowdy ring bearer, we have some tips on how to keep them smiling and happy all night! While children can be a lot of fun, when boredom kicks in there is no stopping their sudden temper tantrums. While passing out noise makers could be the easy way out, remember that you'll have to hear that obnoxious high-pitched noise all night. By having games and fun toys, you will avoid the kiddos from knocking over your fabulous five-tiered cake. Not to mention their parents will thank you later because they'll actually be able to enjoy themselves and eat their dinner in one sitting. Not sure where to begin? No worries! We're here to help you with how to keep the kid table well stocked with fun games and activities! 1.) Craft Table Cloth: Having a craft table-cloth is great because you don't have to worry about spills and accidents, and it can also opt as a coloring palette. 2.) Crayons & Candy: Make cute little bundles of crayola crayons and lollipops for each table setting. Coloring is always a great and easy way to keep kids occupied. Not to mention it'll keep their creative juices flowing! 3.) 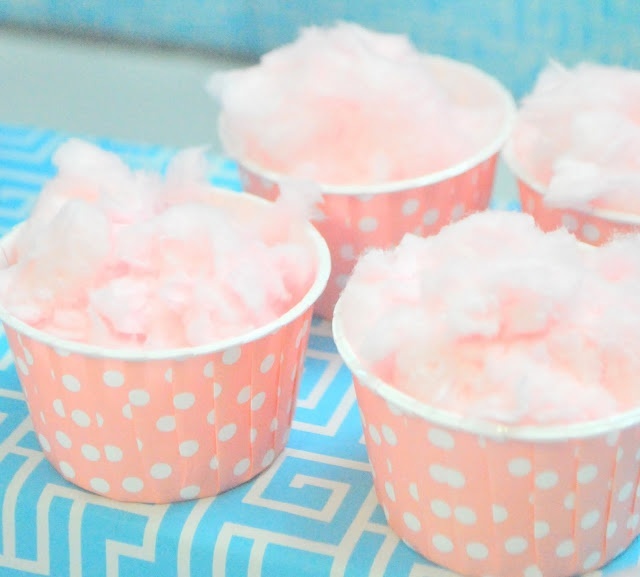 Cotton Candy: Having mini cotton candy sticks or cups is an awesome kid-friendly food. They'll have a ball eating it and most of all playing with it. Remember to keep the amount to a minimum. We don't want them getting a sugar-high! 4.) Washable Ink Stamp Set: Stamps are fun and interactive! This particular set is washable, so even if they decide to mark themselves on the forehead, it'll wash off before family portraits are taken. 5.) Bubbles: Who doesn't love bubbles? This option is great for older kids. Not so much for the youngsters, because there is always that fear of them gulping it down. 6.) 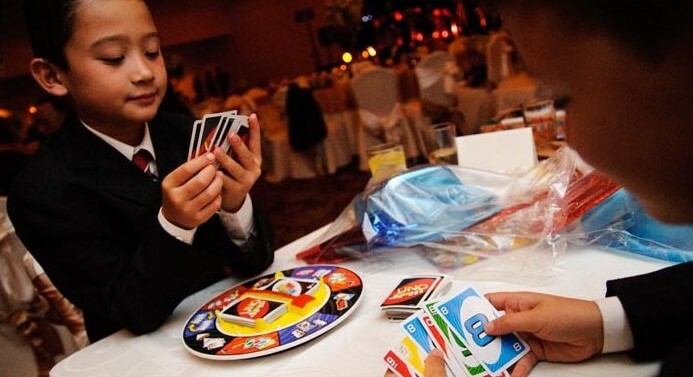 Puzzles & Games: Uno, Monopoly, or Candy Land are all great choices to keep at the game table. 7.) Scavenger Hunt: This is by far my favorite option! Though on the pricier side, kids love scavenger hunts. Place a few disposable cameras on each kid's table, and have them team up to capture pictures from a list you have put together. 8.) Personalized Activity Book: While the grown-ups are sippin' on some bubbly, the kids can be working on crossword puzzles and mazes that you as a couple have personally put together. There are a ton more options, but these are just a few of our favorite picks. Hope this helps!